The Lotus Sutra or Sutra on the White Lotus of the Sublime Dharma (Sanskrit: Saddharmapundarīka-sūtra; 妙法蓮華經 Cn: Miàofǎ Liánhuā Jīng; Jp: Myōhō Renge Kyō) is one of the most popular and influential Mahāyāna sutras in East Asia and the basis on which the Tiantai and Nichiren sects of Buddhism were established. 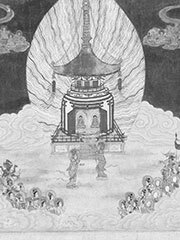 Like all Buddhist texts, it was probably written several hundred years after the death of Sakyamuni Buddha. According to translator Burton Watson, it may have been originally composed in a Prakrit dialect and then later translated into Sanskrit to lend it greater respectability. This sutra is well-known for its extensive instruction on the concept and usage of expedient means (方便 Jp: hōben), mostly in the form of parables. The Lotus Sutra was originally translated into Chinese by Dharmaraksa around 290 CE, before being superseded by a translation in seven fascicles by Kumārajīva in 406 CE. It has been translated into English by Leon Hurvitz, Burton Watson, and others. The Chinese title is usually abbreviated to 法華經, which is read Fǎhuā Jīng in Chinese and Hokekyō in Japanese. At least some sources consider that the Lotus Sutra has a prologue and an epilogue, these being respectively the Sutra of Infinite Meaning (無量義經 Jp: Muryōgi Kyō) and the Sutra of Meditation on the Bodhisattva Universal Worthy (普賢經 Jp: Fugen Kyō).